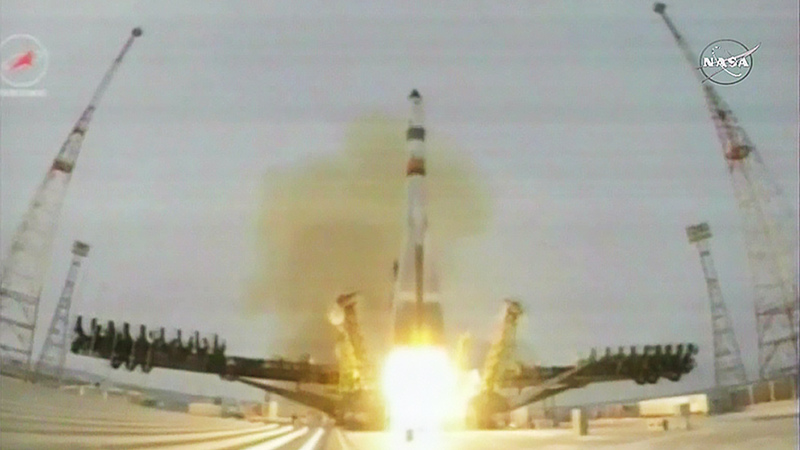 Carrying more than 2.8 tons of food, fuel, and supplies for the International Space Station crew, the unpiloted ISS Progress 62 cargo craft launched at 3:44 a.m. EST (2:44 p.m. local time in Baikonur) from the Baikonur Cosmodrome in Kazakhstan. Less than 10 minutes after launch, the resupply ship reached preliminary orbit and deployed its solar arrays and navigational antennas as planned. The Russian cargo craft will make 34 orbits of Earth during the next two days before docking to the orbiting laboratory at 5:31 a.m. Wednesday, Dec. 23. At 8:10 a.m. EST, Expedition 46 Commander Scott Kelly and Flight Engineer Tim Kopra of NASA will exit the station’s U.S. Quest airlock to conduct a previously unplanned spacewalk to help move the station’s mobile transporter rail car so it can be latched in place prior to arrival of the Progress spacecraft. NASA TV coverage of the planned three-hour spacewalk will begin at 6:30 a.m.
Watch live on NASA TV and online at https://www.nasa.gov/nasatv. NASA Television will provide live coverage of Progress 62’s arrival to the space station’s Pirs docking compartment beginning at 5 a.m. Wednesday. Does anyone know why Progress is taking 2 days to reach the ISS and Soyuz takes only a few hours? Is it because this mission also entails testing en route? The Progress is a modified design and Russian mission controllers are testing its upgraded software and telemetry systems during its flight to the Pirs docking compartment.